The question “what are solar cells” and “how do solar panels work” are often asked by those interested in this booming technology. A solar cell, also known as a photovoltaic cell is an electrical device which converts sunlight into usable electricity. This phenomenon of turning light into energy was first discovered by a 19 year old French physicist named Edmond Becquerel in the 1830’s. What Becquerel discovered was a process referred to as the photovoltaic effect. He found that he was able to generate a small amount of electrical current when silver chloride and platinum were submerged in an acidic solution and exposed to sunlight. After this initial discovery, it took other scientist and engineers expanding on his findings nearly 100 years of trial and error to develop a solar cell which was capable of generating electricity efficiently. This breakthrough came when Alexander Graham Bell’s company Bell Labs developed a technique to manufacture solar cells using a silicone semiconductor. 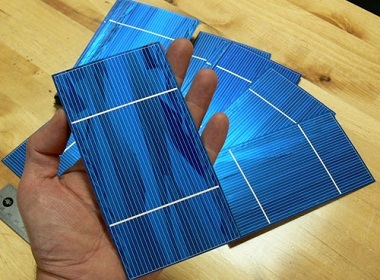 Today multiple solar cells are wired together to form what is called a solar panel. These solar panels are used to generate electricity for homes, office buildings and cars as well as things that are off the grid such as light houses and rail road crossings. Many people take solar panels for granted when in fact they are used to power many critical infrastructures including the space satellites that allow us to use our mobile phones and GPS systems. Think about that the next time you use your cell phone to make a call. 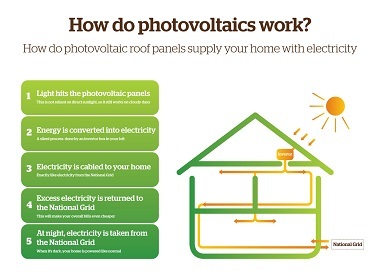 Now that you understand what a solar panel is, we can talk about how solar panels work. As we’ve previously mentioned, solar panels are nothing more than a collection of individual solar cells. These solar cells rely on the photovoltaic effect in order to convert light from the sun into electricity. This means in order to fully understand how solar panels work we must go into further detail about the photovoltaic effect. This effect only works with certain semiconductor material; this is why silicone or similar elements such as germanium are most commonly used to manufacture these cells. As the name implies a semiconductor is a material which can partially conduct current. Adding different impurities such as boron or phosphorus slightly changes the chemical make-up of the semiconductor and allows for greater control over its electrical properties. To use one of these semiconductor devices to convert sunlight into electricity, electrons on the outer most band of an atom most be knocked free. Semiconductors used in solar cells are manufactured using what is called a p-n junction. Both the p-side and the n-side of this junction are made from silicon. However, they differ in the types of impurities they contain. The p-side normally referred to as the p-type usually contains boron impurities, whereas the n-type most commonly contains phosphorus. Once you have a silicon p-n junction, you have what it takes to convert sunlight into electricity. All elements have electrons which orbit the nucleus. Naturally, some have more than others. The electrons that matter to us are those found in the valance band. These are the electrons orbiting the furthest away from the nucleus. Silicon has 4 electrons in its valances band and prefers to keep it this way. However when infused with boron to make a p-type semiconductor its chemical make-up is changed to where it only has 3. When using phosphorus to make an n-type semiconductor the structure is changed to where it has 5 valence electrons. When sunlight comes in contact with the extra electrons found in the n-type semiconductor they are knocked free from their atom. Because silicon prefers to have exactly 4 valence electrons, the freed electron from the n-type semiconductor finds its way to the p-type semiconductor which is electron deficit with only 3. It is this electron movement that allows power to be generated from sunlight. This process is repeated billions of times in each solar cell. As a result, solar panels typical provide about 100 – 320 watts each. These panels can be arranged in arrays which can provide enough power for virtually any application. Now that you know what goes into making a cell, let’s put some of this knowledge to use by making our own home-made solar panels. Note that the solar panels discussed in this article so far are consumer grade. They require advanced techniques and equipment to manufacture them. Because of this we will be using a much simpler method which will produce a solar cell that is capable of generating a few micro-amps worth of power. Cut a piece of copper flashing roughly the same size as the burner on your hot plate. Afterwards be sure to use your sand paper to remove any corrosion such as sulphide from your copper. Next place the copper sheet on top of the burner and turn it on to its highest setting. Let the copper heat up for about half an hour or until it develops a burned look. This thick black material is cupric oxide, once it has formed turn off your hot plate and be sure not to touch the copper for at least half an hour. Once it has cooled to room temperature you should notice most of the cupric oxide has come off. At this point run the copper under water to remove more of the cupric oxide. Be sure not to deliberately force any of the oxide off. Just allow the water to do its job as some small bits of oxide is okay. At this point cut another small piece of copper that is the same size as the first. Take the plastic bottle and chop the top portion off leaving bout ¾ of the bottle. Place the two copper sheets into the empty bottle on opposite sides making sure they don’t come in contact with each other. You should use the alligator clips that came with your multimeter to hold the sheets in place. Be sure that the positive lead is connected to the newly cut copper plate whereas the negative lead is connected to the oxidized plate. Next, in a separate container mix a few tablespoons of salt with some boiling water. Once the salt has dissolved pour the mixture into the plastic bottle containing the two copper sheets. Be careful not to get your alligator clips wet or you may distort the results. Believe it or not this is all you need in order to build your own home-made solar cell. When your solution is in a dark area your meter should be at or near zero. However, when exposed to direct sunlight you should see a rise in the amount of current. It is not uncommon for these sorts of devices to produce over 50 micro-amps each.